Surprisingly oily and smoky start on the nose with a malty backbone. Subtle fruitiness arrives with apricots, lemons and a touch of passion fruit. Soapy, waxy with some floral notes and a whiff of leather in the back. Sweet on the palate with delicate apricots, peaches and lemons, followed by mellow notes of caramel. Nicely warming with a pleasant spiciness of pepper, oak and a hint of peat. Subtle bitter notes of pink grapefruit and bonfire ashes towards the finish. The finish is medium long, warm and slightly sweet with acacia honey, caramel and a touch of pear drops. Becomes dry on the tail with oak, pepper and a whiff of sea salt. Fresh on the nose with more yellow fruit's coming through when water is added. Floral with hints of bonfire smoke in the background. Fruity and creamy on the palate with apricots, lychee and lemons, followed by hints of oak, pepper and malted barley. Creamy with a significantly tamed spiciness. The finish is medium long, creamy and slightly warm with a tamed spiciness and dryness. 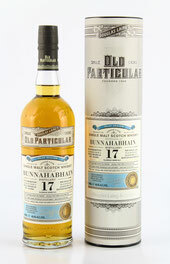 This nice 17 years old bottling is a rather unusual profile for a Bunnahabhain. Fruity and floral, with a soapy, smoky and spicy edge. Very interesting though. Quite a savoury alternative to the (heavily) sherried treats from this Islay distillery. The perfect companion to a cheese and fruit plate.